To enhance your dishes the simple way, explore our selection of mustards and olives – they have notes both classic and innovative, so everyone will find something to love. The finishing touch for meals with a character all their own! 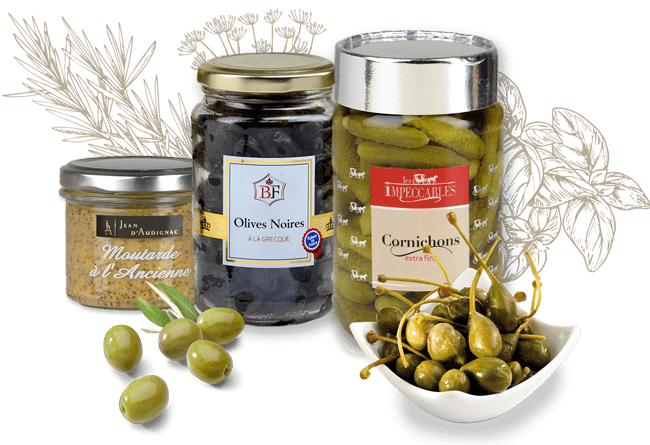 Our selection of French olives and our Jean d’Audignac mustards available in 100g and 175g formats are made in France. From good old classic stuff to forceful, truly piquant mustard, our selection of products suits every taste. Jean d’Audignac 175g mustards have a highly visual patented system that shows the pot’s olive oil content.